Whenever we generate the table maintianence, SAP generates some new code and use the Shared code for the Table maintainence generator. 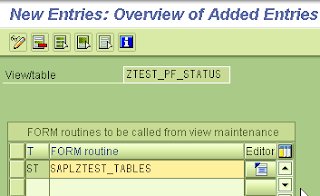 Since long time, I was wondering how can I add my own custom PF buttons in the table maintainence screen which comes in SM30. Today, this discussion in the SDN form raised this point in my mind again – Adding Custon button on Maintainance View. Obviously today’s discussion is based on the Table maintaince, we must have that before we start it. For a information purpose, I will attach a screen shot of the Table maintaince. 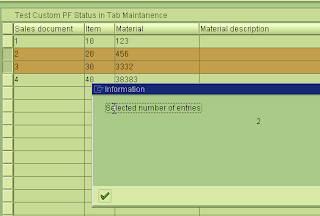 We will copy all the user interface of the main table maintainence program to our Fuction Group. Table maintainence runtime uses the user interface from the program SAPLSVIM. So, we are unable to find any user interface in our FG. There will be one popup of language compatability, which you can pass it on by pressing Enter. Here we need to identify the proper PF-Status from all the statues. 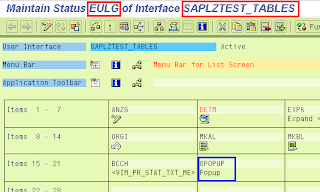 We will use the EULG pf-status which is being called when you enter in SM30 with Change mode. We will add the button with code “0POPUP” We can simply check which pf-status is being used in the each screen of the SM30 by going System > Status > GUI status. We will activate the changed status. 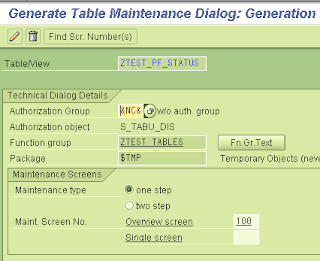 Open the table maintainence generator screen and follow: Environment -> Modification -> Events. Select ST from the values and enter the FG main program name. 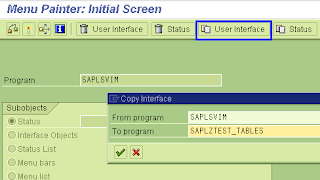 For this example SAPLZTEST_TABLES. Now, we need to create a new PAI module in the Screen flow. We will create the module 0CUSTOM_PF_BUTTON in the Screen. We will create this module in a New Custom include by selecting it from the popup. In this code snippet, I am showing how to handle our user command. Here I am just giving information popup when user interact with the button in the change mode. *       Here TOTAL table is avliable with all the data. DELETE itab WHERE mark IS INITIAL. DESCRIBE TABLE itab LINES l_count. Don’t forget to activate the Function Group, since we have created a new include in it. Here is the screenshot of the SM30 with our new added custom button. A Very Useful Posting….Keep up the good work.. It is Very helpfull post. Keep going in same fashion, CIAO !!! but if you'll regenerate your screen you module will disapear. is there any solution? Good work…Thanks a lot of sharing the knowledge. I have modified table maintenance dialogs in the past. This can be a very useful thing to do. One thing to be aware of, if the table ever changes, and the maintenance dialog is deleted and recreated, all custom changes to the maintenance dialog will be lost. I add all code that is in each event into the table documentation. This allows me to be able to easily and quickly recreate the events and their associated code. But I still have the following problem: if I select some records and push an execution button that does some functionality, I want to delete from the view the successful records. But I'm able to do that only in PAI – using the function DELE. But it is not correct, it should be in PBO. Can anyone has a solution? i have added new button to Ztable and then i have created include this table programs. but when i push the button it doesn't works. i need that, push this button it must call another programs (report in se38). It was very helpful!! solved a lot of issues. even the sample code u wrote ws very helpful!good work! Thanks for wonderful documentation. I appreciate you for sharing your knowledge. The above implementation looks promising, it would be better if you would have also mentioned how to handle future modifications / changes. ** Like, what if i regenerate the maintenance?